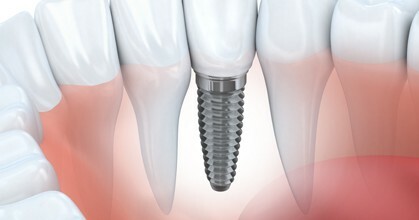 A dental implant is a prosthetic replacement for a missing tooth. Natural teeth consist of the crown and the root. The crown is the visible top section that is covered with white enamel. Supporting the crown is the tooth root, which extends into the jawbone. The root is the part of the tooth that is effectively replaced by an implant. The top of the tooth is replaced with an abutment and lab made crown.